I enjoy the way that John begins the story of the wedding feast at Cana because he presents Mary with a mysterious authority that’s subtle and humble but clearly essential to the narrative. He does this first by introducing Mary before Jesus: “[T]he mother of Jesus was there; Jesus also was invited to the marriage, with his disciples” (Jn 2:1-2). Jesus has just begun his public ministry and he has a few disciples, but Mary, without being a public figure, is presented as the primary guest. This primacy is emphasized in the interactions that follow. Mary informs Jesus that, “They have no wine.” Jesus responds, “O woman, what is it to you and to me? My hour has not yet come” (Jn 2:4). It’s a puzzling response, and I will return to it later, but for now I want to focus on what happens next. Mary says to the servants, “Do whatever he tells you” (Jn 2:5). These are the last words that Mary speaks in the Gospel, and they are powerful. Who is this “woman”, and why is her authority a prerequisite for the servants to obey Jesus? The wedding feast at Cana isn’t, of course, just a nice story about Jesus saving a party. God planned the event and John is recounting it so that we may learn more about how God works. The first thing that we should recognize is that Mary’s role is real. God has placed her in the story of salvation for a reason. She is the means by which he chose to enter the world, and she remains, even after Jesus is an adult, an intermediary between him and those in need. 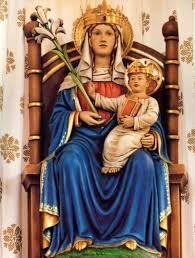 At a deeper level, Mary is the New Israel, the new bride of God, and she is interceding on behalf of old Israel – the other people at the party. Old Israel is out of wine. That’s what Isaiah is speaking about in the first reading: “For as a young man marries a virgin, so shall your builder marry you, and as the bridegroom rejoices over the bride, so shall your God rejoice over you” (Is 62:5). Because of old Israel’s infidelity, God allowed her to be taken into exile, but he promised that he would vindicate her. Mary is already vindicated, she is the Immaculate Conception, and she is interceding on behalf of those who are still in exile. This reality is alluded to when Jesus says to her, “O woman, what is it to you and to me?” Mary has already received the new wine through a special privilege of grace; however, in order that others will be drawn to the new marriage, Jesus performs his first “sign”, changing water into wine, which points ahead to the new marriage that will take place between God and his people. This “new marriage” is what Jesus is referring to when he says, “My hour has not yet come” (Jn 2:4). In the Gospel of John, whenever Jesus says, “my hour”, he is referring to his crucifixion. Therefore, his response to his mother indicates that he already intends to give them new wine. His Precious Blood, poured out on the cross to save us from sin, is the new wine. And, of course, as Jesus says later in John’s Gospel, “Truly, truly, I say to you, unless you eat the flesh of the Son of Man and drink his blood, you have no life in you” (Jn 6:53). This is the reality presented in the Eucharist. The Mass is the re-presentation of Christ’s sacrifice on the cross, which is also the celebration of his marriage to the Church at which he gives us the new wine. At Mass, under the appearance of bread and wine, we receive the Body and Blood of Jesus. During the wedding feast at Cana Jesus changed water into wine. Both the appearances and the substance were changed. If he had merely added colour and flavour to the water, the steward could not have said, “Every man serves the good wine first; and when men have drunk freely, then the poor wine; but you have kept the good wine until now” (Jn 2:10). Changing appearances is one thing, and changing the substance is another. In the Eucharist God leaves the appearances of bread and wine, but he changes the substance (i.e., transubstantiation). Even though we do not see the change in substance, we know by faith that it has taken place. The wedding feast at Cana is a sign pointing us to this deeper reality.